In that write-up, I regaled the four or five people who actually read it with the trials and tribulations I had to endure during my most recent experience with that 1988 release. Basically, Racket Attack is a hot mess. It's slow, slippery, and frustratingly difficult. Well, guess what? 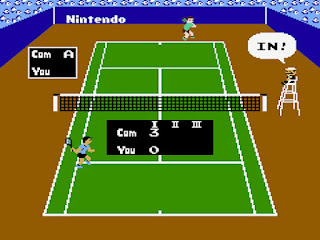 Some of those same words could be used to describe Nintendo's Tennis from 1985. OK, so Tennis isn't exactly slow. Or at least the player sprites don't move slowly. No one is going to accuse the ball of racing through the air, though. * When it comes to player-controlled characters, you've got just one option--a white guy with dark hair. * As for opponents, there are just five in the entire game. They're also caucasian men. 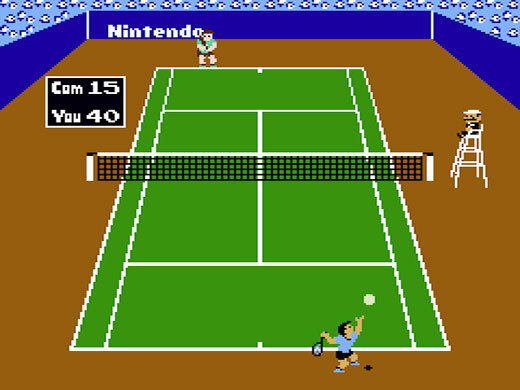 * Your repertoire of moves consists of two serves (a fast one and a slow one), a "flat" forehand, a similarly struck backhand, a lob, and a volley. * Every match you play in Tennis takes place on the same "hard" (concrete) court. Look elsewhere if you care about carpet, clay, or grass surfaces. This tennis title would be annoying enough if that were the extent of its "cons." Unfortunately, it isn't. In fact, the game's final noteworthy negative is the one that impacts gameplay the most. What is it? It's that positioning your character sprite in Tennis is an overly finicky exercise. If you're not in the right spot, you'll totally miss the ball. Or you'll hit it but send it many feet wide of the sidelines. Given all of the above, why am I even writing about about this ancient cart? Or what prompted me to give it a "second chance" it seemingly didn't deserve? It all started when I subscribed to the just-launched Nintendo Switch Online service and downloaded the complementary NES app. 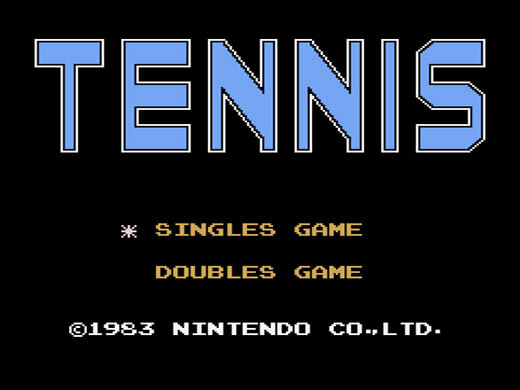 After playing a few rounds of Balloon Fight's "Balloon Trip" mode (as you do), not to mention a couple of go-throughs of Donkey Kong, I clicked on Tennis without giving it much thought. It looked and sounded and felt just as antiquated as I remembered, of course, but for some reason I didn't exit out of it after a handful of games. Time for me to sashay away from the game once and for all, right? Wrong. I'm actually kind of pumped to play it again. I can't guarantee I'll give it the time of day after I defeat even one of its handful of opponents, mind you, but until that happens, I'll probably return to it now and then to see if I can make any headway against the competition. 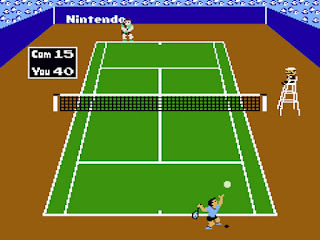 Have any of you played Tennis? If so, what do you think about it?